After the War, after the Holocaust, Europe had to rebuild. At times the most convenient construction material was Jewish tombstones. The Nazis used stones taken from desecrated Jewish cemeteries to erect walls and lay pavements - they even mortared them into chimneys - joining, in an efficiency typical for Nazism, a practical purpose to a ruthless humiliation. 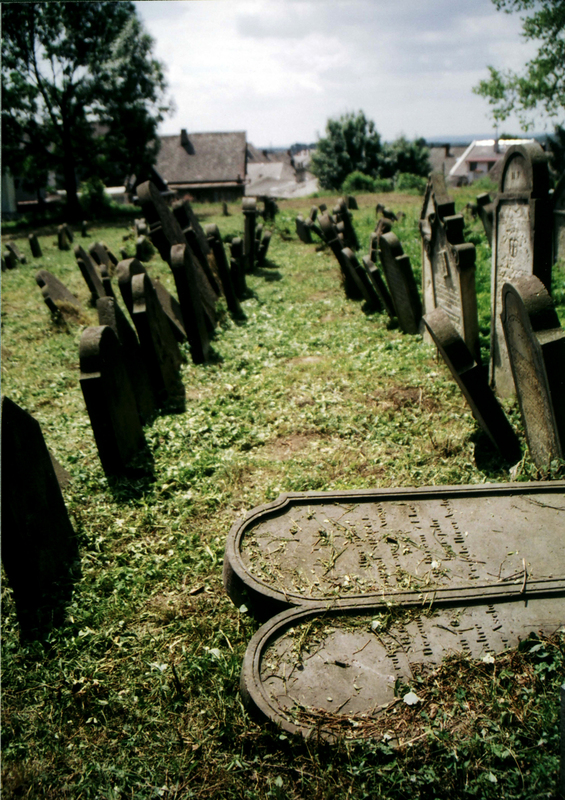 Tellingly however, in Krakow, Poland, the surviving Jewish community itself erected a cemetery wall out of tombstone fragments - inlaid shards of names, mosaicked chips inscribed with dates - as a tribute to those whose graves had been lost or destroyed. In MEMORIAL WALL I've made a monument of my own, constellating contemporary images of Jewish sites from my travels across ten countries and over two hundred cities and towns across Eastern Europe. Though these images seek to entomb Jewish Europe, let your engagement with them be proof that Jewish life lives on. My own work developed from the negatives of old photographs. It was sheer luck, pure and simple, that allowed me to be born in the United States, the son of survivors. And now I’m the last Sendak. All the other Sendaks exist in my memories, and in photographs; memories and photographs are today often synonymous terms. Ahron Weiner, camera in hand, has returned to a different Europe, a detail in the large panorama shot of the last century. And not only Europe; Ahron has traveled, widely, in a detail of a detail, in Central and Eastern Europe, a stretch of life bounded by Thereinsenstadt in the West and Majdanek and Sobibor in the East: concentration camps, the horrific last images preserved in the minds of many of the dead. My personal relationship with Ahron is connected to the former camp, Thereinsenstadt, Terezín in Czech. I created a book based on Brundibar, Hans Krasa’s children’s opera, performed in the waning days of the concentration camp, the last days of art, the purgatory before Auschwitz. Unable to make the trip there myself, I asked Ahron to take photographs of the camp, images on which to base my illustrations. He generously provided, responded with sensitive pictures of a terrible place, provided a reality—if there is one—for my fantasies. He allowed me, pencil in hand at my desk, to see. But while my book lives in the past, Ahron—much younger than I—captured a vision that is very much of the present: This is what these synagogues, these former ghettoes, these concentration camps, these cemeteries look like now. But this is more than tourism. This is the ritual of mourning, a shiva postponed for most of world Jewry by circumstances of birth and by the currents of politics. So thank you Ahron, for your dedication and your memory. You have lit my past. MEMORIAL WALL images are custom-printed on Hahnemühle Photo Rag Bright White 310 gsm paper using an Epson Stylus Pro 7800 with Ultrachrome K3 archival ink. Images are available for purchase individually, or as custom site-specific installations.